I was able to finalize this imaging project since I found an older wide field color image of mine from this area. I used colors from this wider field image and it seems to work fine. naturally the resolution is much lower in other than H-alpha channel but it doesn't harm the image too much since there are not much details in O-III and S-II channels in this case. 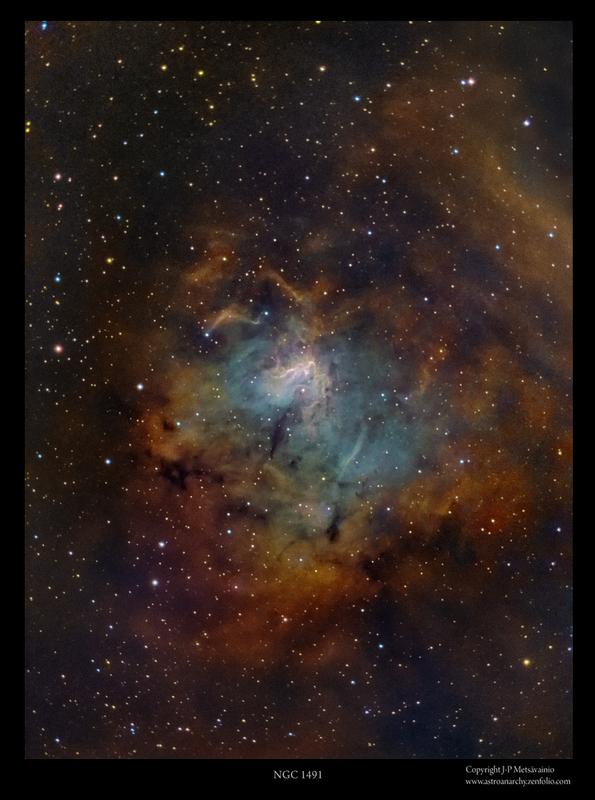 NGC 1491 is an emission nebula, in the constellation Perseus, at the distance of about 10700 light years. The ultraviolet light from the newly born stars makes elements in the nebula glow. There is an an 11th magnitude star in its center. The solar wind, a radiation pressure, from the central star is blowing a bubble in the gas surrounding it. This is a dim one, seven hours of exposures was barely enough to reveal it. 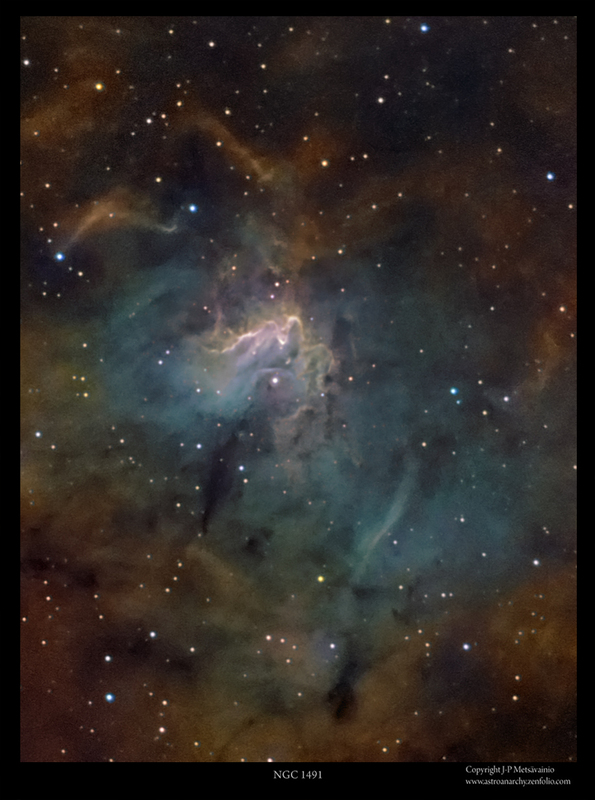 The large nebula at center is Sharpless 205 (Sh2-205), NGC 1491 can be seen at upper left corner.. This Sharpless object is very dim and difficult to shoot (as they usually are). The bright, peanut shape, area at middle is known as Sh2-205, bright nebula, at top left, is NGC 1491. Image spans about 5,5 degrees horizontally, that's 11 full Moons side by side. There are very few images around out of this object. Total exposure time, with a fast 200mm f1.8 optics, is 12h from three nights between 28.01 - 02.02. 2012. 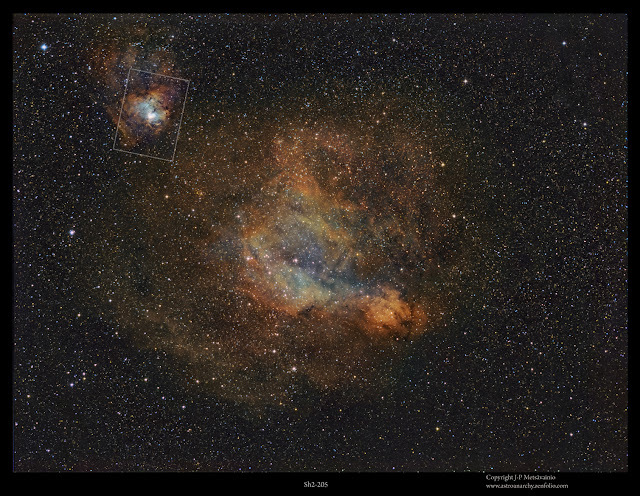 Color channels for O-III and S-II are from an older wide field image. While processing the image, I noticed a familiar shape in the center portion of the image. It seems to repeat itself in various targets. My guess is, that it's coursed by the solar wind from the open cluster usually locates in center of the emission nebula of this type. A collection of targets with same type of shapes as can be seen in center of the this new image. 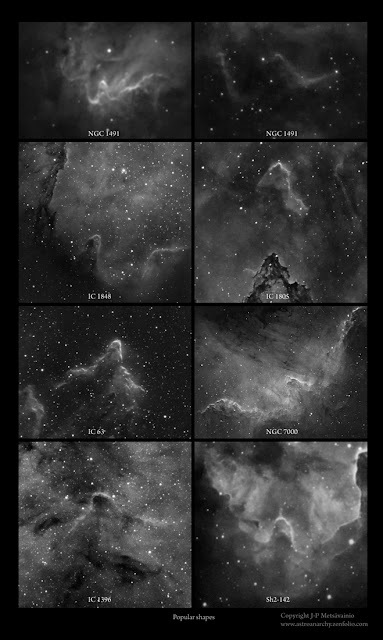 The top most two images are from NGC 1491.